BiOpet™ – Healthy pets, healthy owners, healthy environment! The philosophy of BiOpet organic pet food is to provide a natural, wholesome food for your pet. Organic pet food is free from growth promotants, hormones and antibiotics. It does not contain artificial colours or harmful preservatives. 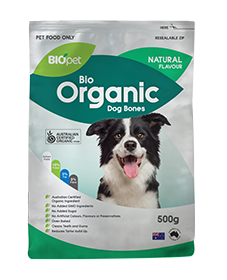 The ingredients used in BiOpet organic food come from farms and producers certified organic in Australia. This ensures the ingredients have been produced without the use of herbicides, pesticides or artificial fertilisers. BiOpet's manufacturing plant is certified by Australian Certified Organic (ACO) to produce organic pet food (Certification No 289P). Our plant is audited annually by ACO to ensure the ACO organic processing guidelines are being adhered to. This organic certification assures the pet owners that BiOpet is quality organic pet food. Organic wholegrain cereals and cereal by-products (derived from any or all; wheat, sorghum, barley, oats, millet, rice), organic vegetable protein (derived from any or all; soya beans, sunflower, canola), omega three vegetable oil (flaxseed oil), natural limestone, sea salt, and vitamin E.
Beef Meal, Chicken Meal (a natural source of Glucosamine), Wholegrain Cereals (Wheat and/or Sorghum, Rice and Oats), Wheat Bran, Tallow, Yoghurt, Whole Linseeds and/or Linseed Oil, Beet Pulp, Natural Prebiotic, Salt, Mixed Tocopherols (Vitamin E), Natural Enzymes, Rosemary Plant Extract, Vitamins (A, D, E, K, B1, B2, B12, Niacin, Folic Acid, Biotin, Choline, Pantothenic Acid, Minerals (Iron, Zinc, Copper, Manganese, Selenium, Iodine, Cobalt), Lutein, Garlic, Yucca Extract, Kelp.